With its sea view, this villa offers a quiet and ideally located for a pleasant stay. 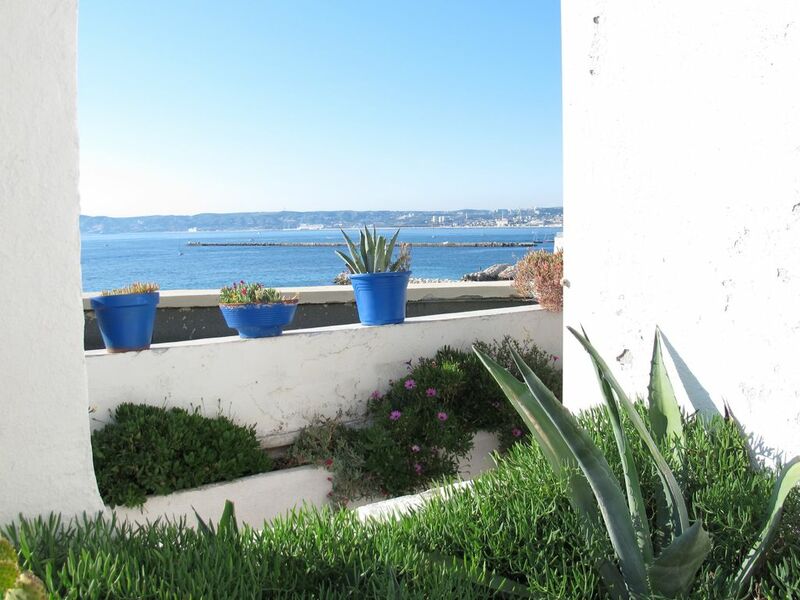 Located in the residential area of ​​Malmousque, it can accommodate 6 people and offers a 180 ° view of the sea. To move and go shopping do not need to take a car. The nearest shops are 100 m away. The port of Malmousque, from where you can access the sea is 1 min from the villa. Calm, Relaxation and Relaxation are on the program. The villa must be left in the condition found on arrival, otherwise he will be charged 200 euros from the deposit. Maintenance for not including weekend rental (80 euros). Fabulous villa overlooking the Mediterranean! Probably the best sea view in Marseille from a wonderful villa on the coast in the old fishing village of Malmousque. The villa was very comfortable and well equipped, and the two terraces perfect for relaxing and taking in the views across the bay. Local amenities were excellent with a small supermarket, Boulanger and several bars and restaurants nearby. The local 83 bus was perfect for trips into the city and to Plage du Prado just along the coast. For a vacation in Marseille this really is the perfect place to stay - thank you Mathilde! A perfect trip to Marseille! We have just returned from one of the most enjoyable and pleasant weeks of holiday our family has experienced. This gorgeous 3 BR Villa is absolutely stunning in it's presentation. The upper and lower balconies look out onto the Mediterranean and the lsle of If with chateau d'if (Count of Monte Cristo) prominently featured. Madame Mathilde greeted us on our arrival and was a perfect hostess. She even hiked a KM to help us with our bags as we arrived the afternoon of the Tour de France (and vehicle access to the property was limited that day). We considered many other areas of France before deciding on Marseille, and we are glad we did. The city is vibrant and authentic and it's people were so polite as we attempted to communicate with our limited French. This villa is located in the quiet fishing village of Malmousque, a 10 minute bus ride from city center via the 83 bus which costs 2 Euros and runs about every 10 minutes. We spent the week exploring the area's of the Provence-Alpes-Côte d'Azur region of southern France. We had a day trip destination for each day (If interested, I strongly recommend considering the team at Tours by Locals - we spent a week with Fabrice "Brice" and enjoyed everything immensely). In addition to several fantastic restaurants, there is a small market and a wonderful bakery that we visited everyday. The villa has a full kitchen, 2 BR upstairs, and a 3rd on the main level. There are 2 separate "water closets" (toilets) in addition to 2 showers and a bathtub. The main balcony has an outdoor grill and covered table (and several dozen plants to provide a traditional ambiance). There is also a beach about a 15 minute walk, or you can just stroll down to the water from the villa for a swim. All in all, I wish I could rate this higher. We have enjoyed many VRBO rental properties, but this has set a new standard for us, we are already looking forward to our return! Thank you Mathilde and Pierre! Charming home with spectacular views! We spent seven June nights in this nice house that is filled with character. It is located in an area that was established many hundreds of years ago, with beautiful narrow alleys and streets with corresponding challenges in driving and parking. The views from the two levels of large balconies decorated with a multitude of lovely plants was spectacular! Unobstructed views of pleasure and commercial boats, fun lining locals swimming, and islands like the famous Chateau d'If of Count of Monte Christo fame. The bedrooms were good sized and the bathrooms small to medium (nice large tub in master, 2 showers). Kitchen was huge and my sweetie loved the vast assortment of cookware and spices. No microwave but we easily adjusted. Parking was hard to find but we always managed to find a spot. All spaces are free in the area. We took day trips to Monaco, Nice, Cassis/Les Calanques twice, Arles/Pont du Gard, and walked over to Vieux Port (old port) and took the tourist train to Norte Dame. We tried five close local small restaurants and a meat market on the Main Street about 100 meters away. Each one had very delicious food. We made daily visits to the local supermarket and the patisserie along the same strip. 😊� We had a great time with everything and Mathilde was the perfect host! We (two couples) spent two days in Marseilles and had a great time. The home is lovely, comfortable and convenient to everything. The view is just spectacular, the pictures as good as they are, can't do it justice. Mathilde and Pierre were very sweet and helpful. We would definitely recommend staying there and would love to return for a longer visit next time. Thank you for sharing your home with us. Ideal for a family holiday. Great terrace to eat outside and very peaceful even though the city centre is accessible. Owners were friendly and helpful. Famille très sympathique,très soigneuse. A recommander. We had a wonderful vacation in Marseille. The views are breathtaking, the location is great. We were able to walk to the port and beach, there are lots of restaurants and a supermarket nearby. The house is well maintained and clean and the owners were very friendly and helpful, taking us for a walk to show us the sights. I would definitely recommend this rental, perfect for families. Visit the port of Malmousque who kept a typical and authentic side. You will come across colorful characters! Push your visit to downtown Marseille. Feel free to test the baptism of scuba diving or rent a small boat for a boat trip in order to try to cross the dolphins! La villa doit être laissée dans l'état trouvé à l'arrivée,dans le cas contraire , il sera retenu 100 euros sur la caution. Entretien non compris pour location week-end ( 80 euros) seuls les animaux de petite taille sont autorisés ( chat ou chien seulement) et 1 seul animal. Prévenir impérativement la propriétaire pour le cas échéant.